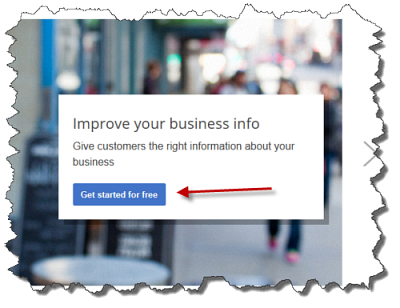 Google Places is a free Google service that helps your business get found on the web. How does it work? 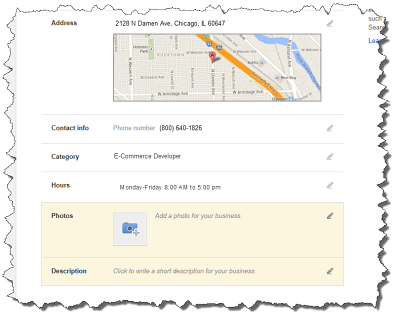 Google collects data from a variety of sources to compose local business listings. 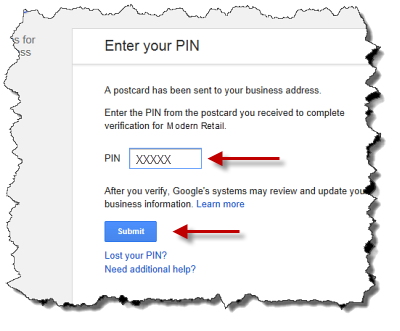 To ensure information is accurate, Google will send you a PIN number so that you can go in and verify your business. Once you verify your business, you can update store information such as hours or parking availability, add images, videos or coupons, and more to market your business. At Modern Retail, we'll take care of getting you started. 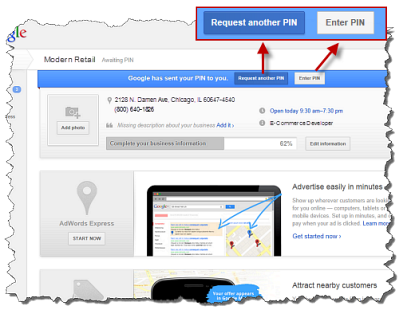 Once we've set up your Google account for Adwords and Webmasters Tools, we'll also initiate the PIN for Google Places. You will receive a message from us letting you know that a postcard will be coming in the mail from Google with your PIN number within one to two weeks. Once you receive your PIN number, follow the directions below to get verified. Go to http://google.com/webmasters and sign in to Webmaster Tools using the Google username and password that you received from us previously. 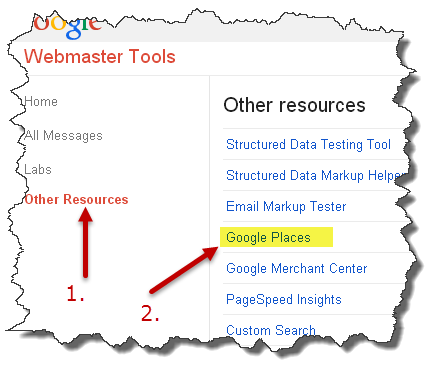 Under Webmaster Tools, select Other Resources then Google Places. Select Get started for free. Along the top blue ribbon, click the button that says "Enter Pin". Once you enter the PIN, click Submit. Your business has now been verified on Google Places. If you do not receive your postcard after two weeks, you can login to Webmaster Tools and follow the same steps to get to Google Places. Instead of clicking the “Enter Pin” button, you can “Request Another Pin”. Once you have verified your business, don't forget to update your information. 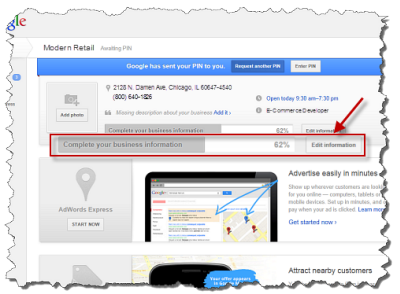 You can go back to Google Webmaster Tools>Additional Tools>Google Places. Select the Edit Information button. Update your information, add pictures, videos or coupons. You can update as often as you like if you want to feature weekly deals. And that's it. Anyone doing a Google Search or using Google Maps will be able to find you easily as well as get the information they need to know about you.